May 29, 2011 - Bombardier signs contract with Dallas/Fort Worth (DFW) International Airport to provide maintenance services for the BOMBARDIER INNOVIA APM 200 automated people mover (APM) system at the airport for 10 years starting in May 2011. The contract is valued at approximately $165 million US (116 million euro). Bombardier has worked together with DFW since the year 2000 when the order for the eight-kilometre, elevated dual-lane guideway APM system was placed. Known as Skylink, the 64-car APM system offers convenient passenger travel in either direction on the comfortable, climate controlled INNOVIA vehicles, connecting Terminals A, B, C, D and E.
Bombardier has been responsible for the maintenance services at DFW since the APM system opened for passenger services in May 2005. Since then, the system has achieved outstanding results in availability, exceeding 99.5% each year. 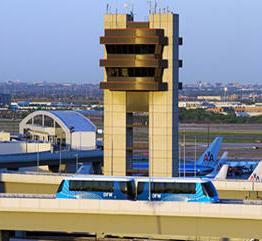 ?Since it opened in 2005, the Skylink people mover system has helped transform DFW into one of the best connecting airports in the world by offering fast and easy access between all five of our terminals,? said Jeff Fegan, Chief Executive Officer of DFW International Airport. ?Skylink has dramatically improved the passenger experience at DFW, and we are truly pleased to continue our long term partnership with Bombardier for the operations and maintenance of the Skylink system.? Commenting on the contract award, Eran Gartner, President, Systems division, Bombardier Transportation, said: ?This 10-year contract extension demonstrates the confidence that DFW Airport has in our INNOVIA maintenance services and the highly reliable performance that can be achieved from our INNOVIA APM product line. Our experienced service delivery team has done a superb job delivering high availability levels since the system opened in 2005.? Gartner added, ?In addition to our on-site team, our INNOVIA APM specialists in Pittsburgh, USA, are developing energy saving solutions for the DFW fleet; this will increase further the value that we bring to our customer?s operations and prove our commitment to continuously improve the services that we provide.? Since the start of operations, the APM system at DFW has serviced more than 31 million car kilometres, always ensuring safe and reliable service. In all its years of operation, there have been no lost time accidents. The highly reliable INNOVIA APM automated people mover systems from Bombardier Transportation have served communities in major cities and international airports around the world for more than 40 years. These include Frankfurt, Germany; Rome, Italy; Kuala Lumpur, Malaysia; Singapore; Madrid, Spain; Atlanta, Dallas Fort/Worth, Denver, Houston, Miami, Orlando, Pittsburgh, San Francisco, Seattle-Tacoma and Tampa, USA. Also in the USA, Bombardier has been awarded operations and maintenance (O&M) contracts for Sacramento, opening in 2011 and Phoenix Sky Harbor, opening in 2012.